The Hampton Court Show Catalogue has a page (p.21) which lets us 'Meet the Garden Judge'. It begins 'Martin Slocock has spent a lifetime in horticulture. After two years in the RAF, he obtained an Honours Degree in Botany at Oxford and then joined his family's nursery company.' This, one can imagine, is like asking a man to judge the Royal Academy Summer Show because he has a degree in chemistry, from Oxford, and his family manufactures oil paints, and he has been in the RAF. Doubtless, there was a team of judges but teams are led by leaders and one has to worry that this year's judging will lead next year's designers astray. 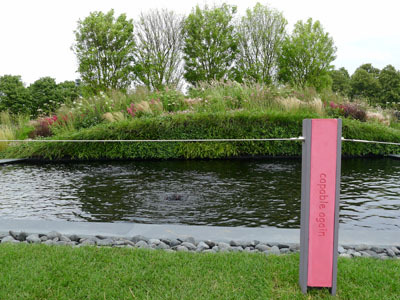 My impression of the 2012 Show is that it has put the art of garden design into reverse. Forgive them, O Lord, for they know not what they do. The show gardens in receipt of gold medals were an advert for the Jordan Tourism Board (the Discover Jordan Garden), a garden sponsored by a company which makes a drug for Overactive Bladders, and a garden, called Contemporary Contemplation, sponsored by a garden design company working with a garden construction company. Only the latter merited an award. The Discover Jordan Garden, designed by Paul Hervey-Brookes, is feint evocation of the rose-red city of Petra. The city is wonderful. It may have had vegetable gardens outside the gorge in which it was built but, assuredly, they looked nothing like this. The charbagh pattern of canals is especially ridiculous – Petra was destroyed by an earthquake hundreds of years before Islam originated. The Overactive Bladder Garden is based on the ugly idea of taking a bladder as the inspiration for a garden. We have every sympathy for suffers and certainly think they should have the best medical care but there is no more reason for using them as a motif than there would be for a Haemorrhoid Garden. The planting is well done but why should it be on a bridge? If the bridge was over a road, OK. But people like seeing water. Pink adverts for bladder problems spoil the steps on garden. The Contemporary Contemplation garden is a successful exercise in Modernism. It would have been brilliant if done a century ago and is pretty good even in 2012. But in what way does it, or could it, induce contemplation? The only respect we can think of is that it could make one reflect on the strange fate of Modernism in garden design. Why did it receive so little attention from 1910 to 1940? Why is it so popular now? But, to be fair, this garden does have some postmodern decoration. The Uprising Garden, in the Conceptual Gardens category, only got a Silver Medal. It does not express the concept very clearly (it was based on the summer riots of 2011) but the planting is good and it was a good idea to treat the pattern on the wall as an 'echo' of the planting design.